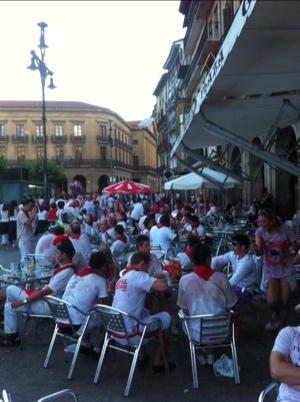 There is just one dress code required for Pamplona right now. 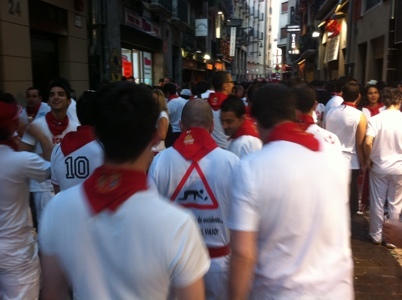 Wherever you look in this packed, alcohol-fuelled city, people of all ages are wearing their white trousers and tops adorned with red neckerchiefs. They dance in the streets to the sounds of impromptu gigs from bands, tossing Sangria in the air soaking fellow party goers. Many are too drunk to realise that their outfits are now stained pink and dripping wet. It’s all part of getting in the festival spirit. 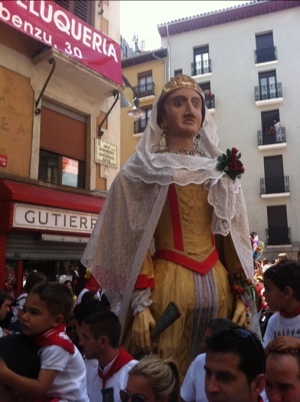 Yes, Pamplona’s fiesta Sanfermines is well and truly underway – 10 days of processions, partying, fireworks and the daily suicidal act of running with bulls. Bars, cafes and discos stay open through the day and night, allowing people to keep their alcohol levels topped up. It seems quite surreal fighting past the DJ booth to get served when it’s only early in the morning. With more than half a million people packed into such a small space moving around can be quite a challenge – and it makes London look quiet in comparison. No one is complaining though. But despite all the alcohol being consumed and the hot weather, people are good natured and well behaved. Everyone is just out to have a great time and visible police presence is very low. This sort of event would descend into chaos in England. We’ve spent the two evenings here so far in the main plazas enjoying the free live music that is being blasted out from giant sound stages. The hotels in the town are of course full to the brim, but many people have simply not bothered to book accommodation. When they can’t stand up any longer they bed down wherever there is a free spot (be that in the street or in a park) and grab a few hours sleep – ready to party again tomorrow. 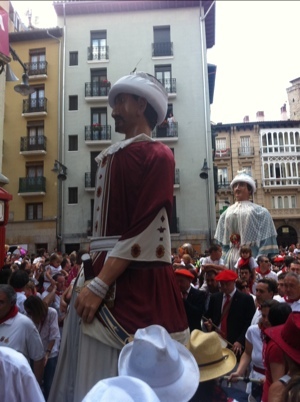 After a few days chilling by the beach, this Spain stay has well and truly moved from siesta to fiesta. Party on!